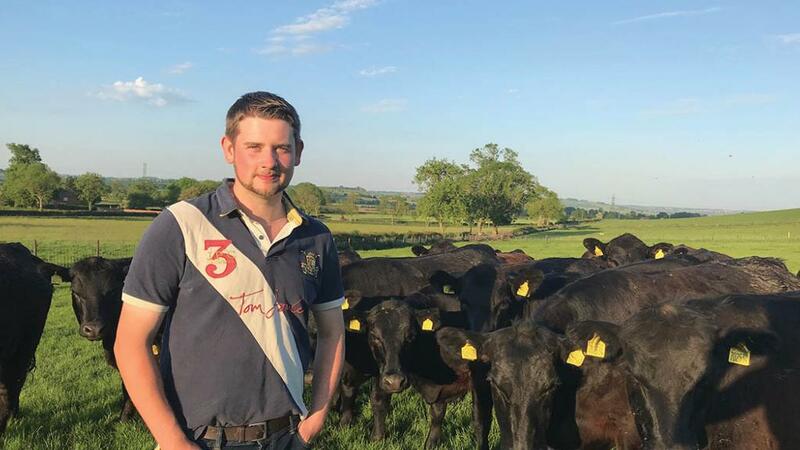 Pat Armitage, 23, is a herdsman on a 300-hectare (741-acre) organic farm with 700 pedigree Lleyn breeding ewes, 45 pedigree Aberdeen Angus cows and 300 Angus cross finishing cattle. Career: I grew up on the family beef and arable farm in East Yorkshire. My best memories growing up are spending time sat on the tractor or helping with the livestock. As a teenager I found the balance between weekend milking at a neighbour’s farm and rearing calves at home, which helped me realise my passion and gain experience for working with livestock. I studied agriculture with animal science at Harper Adams, including a year working on a 600-cow grass based dairy. I was then lucky enough to find my ideal job in Leicestershire, where I am employed as the herdsman on an organic sheep and beef farm. Having the opportunity to leave my comfort zone and work with sheep under an organic system has been a steep learning curve. During January we established a pedigree herd of Aberdeen Angus cattle with the purchase of 45 cows and heifers. Developing this is an exciting challenge. Day-to-day: With groups of cattle and sheep scattered across the farm, the routine starts with daily checks. Keeping on top of health issues often slows things down. Catching lambs in the field is becoming increasingly difficult as they become faster and wiser. Running the cattle on a mob grazing based system has reduced the workload to pasture moves and daily checks, with the exception of carrying out a whole herd bovine TB test last week. Testing the herd at grass was a logistical challenge and an unwelcome break in routine for the cattle and ourselves. The overall mood improved post-testing with a clean sweep across the board. Weighing the oldest finishing cattle is set to start in the next couple of weeks with animals nearing specification being separated out and fed a cereal mix to improve conformation and finish. Future: Having recently spent time responding to Defra’s Health and Harmony consultation, I am hopeful that by leaving the EU, the agricultural policy of the UK undergoes a radical reformation. I feel the current system of Government support for agriculture is highly centred around maintaining existing farm businesses. This creates numerous barriers for new entrants into the industry and results in an aging farming population less willing to adopt new methods and techniques. The lack of detail surrounding food security is a concern, particularly when imports can be used to undercut domestically produced food. I am traveling to the United States to study the beef industry in September. By visiting the world’s largest beef producer I aim to see how British beef farms can take advantage of new opportunities and technologies.